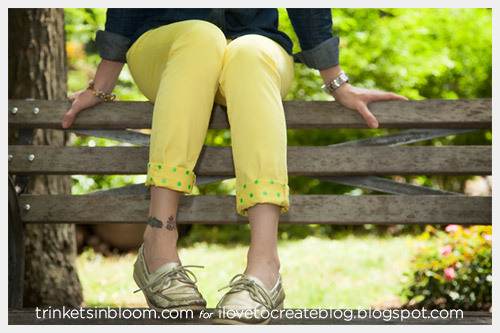 Sometimes a simple solution can be the best, I love the subtle color and pattern on these DIY Jeans with Printed Cuffs. For those who don’t want to wear an allover printed pair of jeans this is a perfect solution. A subtle pop of color at the ankles adds an unexpected touch and just the right amount of color. 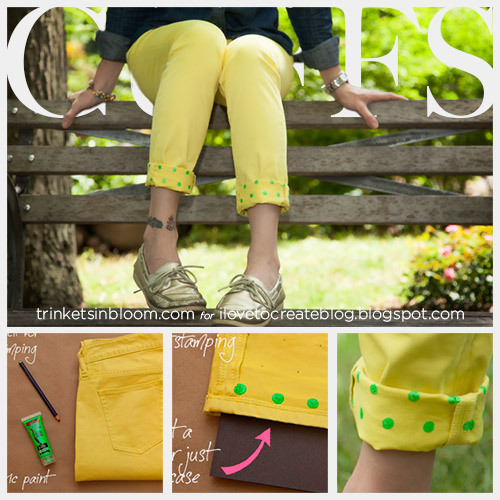 Combine them with this seasons brightly colored jeans, you'll have a fun and on trend pair of DIY Jeans with Printed Cuffs. When you’re choosing your jeans make sure they are long enough to cuff. 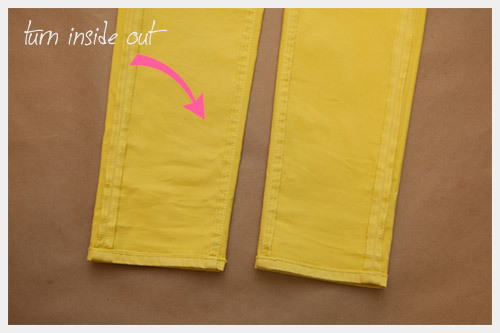 Turn your jeans inside out and lay them out flat. You can either make your dots random and just eyeball the spacing or you can use a ruler to make sure they are all even. You’ll also want to make sure that your pattern goes up high enough for your cuffs, depending on how long your jeans are (I cuffed mine a couple times). Put a piece of paper or cardboard inside the leg of your jeans. 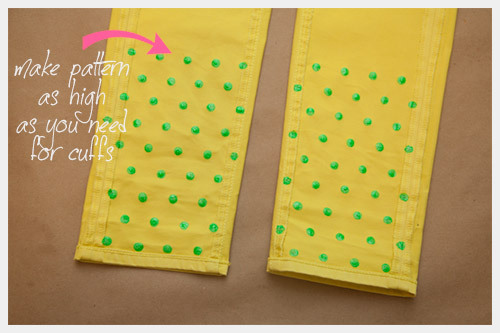 Most jeans are thick enough that the fabric paint won’t bleed through, however, some colored jeans are a little thinner. Better safe than sorry. Squeeze a little of your Tulip soft fabric paint out on a paper plate and dab the end of your pencil in your paint and stamp it on your pants. 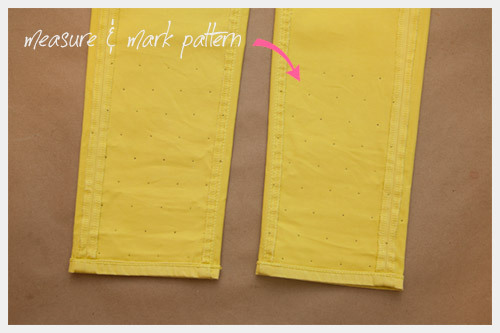 TIP: try your stamping out of a piece of paper or scrap fabric first to make sure your stamp will look the way you want. I dabbed my pencil in my paint each time I stamped it on my jeans. Otherwise I noticed that my dots were too small and the paint wasn’t consistent. Continue stamping your jeans. 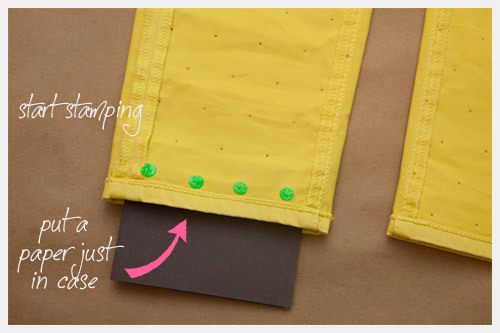 When you are finished with your first side, let them dry before flipping them over and stamping the other side. 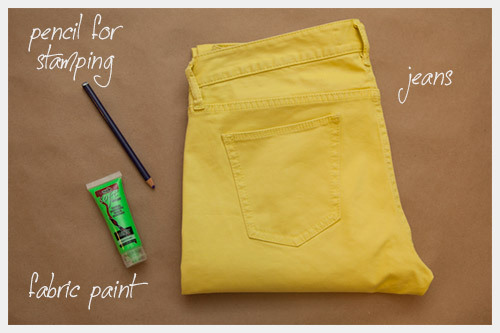 Let your jeans dry for a few hours or overnight to make sure the paint is completely dry before washing or wearing. 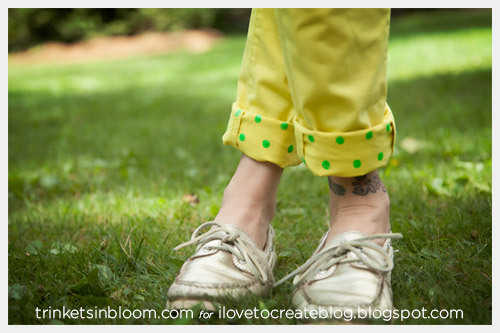 For more fashion DIY’s check out my blog at Trinkets in Bloom. Okay, these are darling! 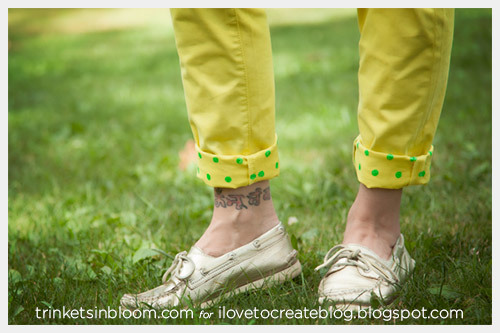 I saw the itty bitty facebook pic and thought you were lining the cuff in fabric, only to find paint dots. Cute! I shared this with our group members on Cafemom Holiday and Party Crafts too! We're always looking for ways to craft for gift giving! How simple, adorable and easy to make! Thanks for sharing such great ideas. I love that you have become so crafty. I’m pretty sure that I would never try to paint my pants, but you did a great job.